Many of our prettiest insects are nectar feeders that need flowers for their survival. 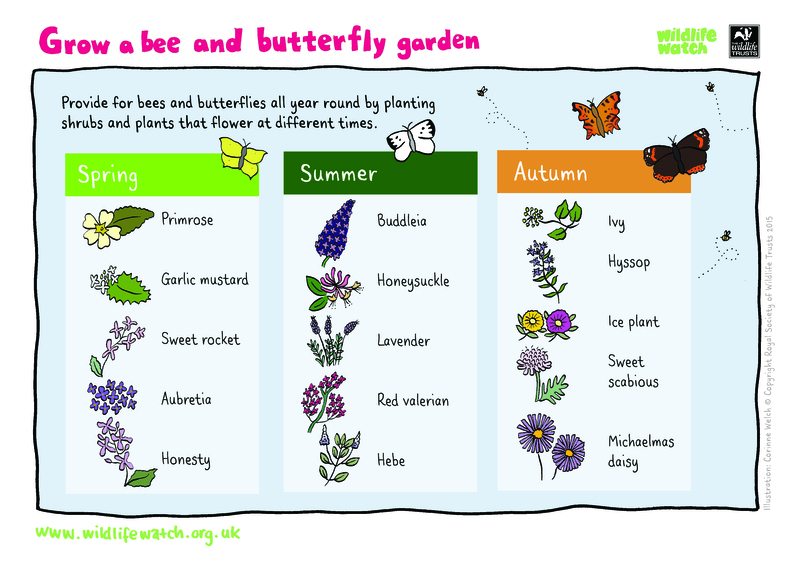 Butterflies, moths, bees and hoverflies all need sources of nectar and pollen to thrive. As they travel from flower to flower they also pollinate them and enable them to set seed or bear fruit. Setting up a nectar café is of benefit to your plants as well as allowing you to enjoy the flitting of beautiful butterflies from the comfort of your garden! When planting an area for wildlife, it is important to know your soil type. Not all the plants listed below will be suitable for all soil types, and may not grow properly or die completely. Fold a piece of kitchen paper into a funnel and place in a jar, then fill a small measuring jug with a recorded amount of water. Place a tablespoon of your dry soil in the funnel and add water to the centre of the soil. Stop adding water when the first drop falls into jar, noting how much water you have added. Wait until soil has drained. Measure the volume of drained water: if over half of the added water is recovered, your soil is well drained. Take a look at our suggestions for plants and flowers through the seasons, or take a look at the RHS 'Plants for Pollinators' download below. Choose a mixture of seasonal flowering plants, shrubs and trees to ensure a year round food source in your garden. Growing host plants in the garden is not necessarily guaranteed to attract the relevant butterflies, but it's worth experimenting to see which species find your garden most suitable.